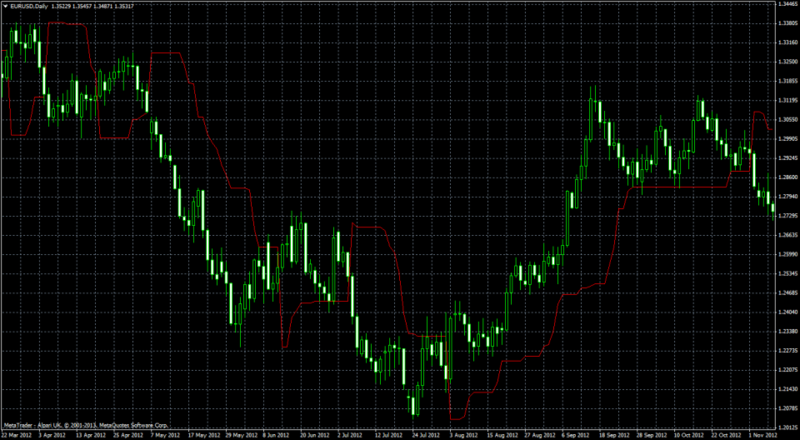 The Trend Stop Indicator’s primary purpose is the detected change in the trend for the selected time period. The Trend Stop indicator will show Highest / Lowest value of the last N periods. Depending on the current trend direction, this will be Highest High of last N periods for Down trend, respectively Lowest Low of last N periods for Up trend. Trend change will occur, is detected, if the closing price crosses over Trend Line Stop. Potential positions are suggested by price / Trend Stop Crossover. Open Long position if Price crosses over Trend Stop Line. Open Short positions if Price crosses under Trend Line Stop. The secondary purpose of this indicator is to suggests potential optimal levels for stops. Place all your stop orders below the Trend Stop Line for Uptrend, and respectively, above the Trend Stop Line for the downtrend. If the closing price crosses over Trend Stop Line, a trend change will occur. If the closing price crosses under Trend Stop Line, a trend change will occur. If the high price crosses over, Trend Stop Line, a trend change will occur. If the low price crosses over, Trend Stop Line, a trend change will occur. Type – (0 or 1) – Select one of two trigger Modes for Trend Stop Trend change.